Undoubtedly, face is one of the most important aspects that contribute to an individual’s pretty look. When your facial features are sharp, you look much beautiful and pretty. And if I have to choose one facial feature that I think contributes maximum to the beauty, then I think it’s going to be the eyes, eye brows and eyelashes. Unfortunately, my eyelashes were not long and think enough and I always used to wonder if there are ways to get it right. Thankfully there are few simple home remedies that can help you to grow long eyelashes and thicker eyebrows naturally, and that’s what I am going to talk about in this post. Today, I am sharing a few of the best home remedies to grow long eyelashes and thick eyebrows. And if you have ever wondered about how to grow longer eyelashes then here are the natural remedies worth trying. Your eyes not just help you see the world around, but beautiful sharp eyes make you very attractive and expressive. Eyes are the mirror of your heart that shows how a person can be both inwardly and outwardly beautiful. But, what makes the eyes look so attractive? On what basis can you judge the outer beauty of your eyes? Well, the shape of the eyes is definitely one important factor but apart from it, it is the eyelashes and the shape of the eyebrows that gives the perfect intensity and outline to your eyes respectively which in turn, makes your face even more pretty. While some are blessed with beautiful eyes, others are not so lucky but not to worry as there are natural ways to enhance the beauty of the eyes. I know you cannot change the shape of your eyes, but you can always try and increase the volume and length of your eyelashes and make the eyebrows naturally fuller to make your eyes look big and attractive. Now, if you are interested to know how then keep reading this post. Today, I will be discussing on some easy natural home remedies to grow longer eyelashes and fuller eyebrows. You can easily find a huge number of cosmetic products starting from eyebrow drawing pencils, to mascaras, to fake eyelashes etc in the market. These cosmetic products are meant to make your eyelashes thicker and longer and your eyebrows fuller. The high demand of these products shows how important it is for all of us to grow long eyelash and thicker eyebrows. But, what one fails to understand is that these products can just beautify your features temporarily and so there is no point in thinking them to be the ultimate solution to beautify your eyes. In fact, in many cases, the cosmetics contain chemicals that can do damage to your skin and even can any day affect your eyesight as well if by mistake they come in contact with the inside of your eye (which can happen anytime). And why take chances when you can grow your eyelashes and thicken your eyebrows naturally? It is always better to try natural remedies that can actually gift you with permanent benefits in growing your eyelashes longer and eyebrows thicker. And, if you want to go all natural, then try some of the natural home remedies to grow long eyelashes and fuller eyebrows. Who does not like to look attractive? Who on earth can underestimate the power of beautiful eyes? But if you are concerned about how to grow longer eyelashes and thicker eyebrows naturally then there is no need to worry, because there are natural remedies to get it right. Listed below are the best natural home remedies to grow long eyelashes and thicker eyebrows, easily at home. The easiest and the best way to grow longer eyelashes and fuller beautiful eyebrows are by using castor oil. This is because castor oil is carrier oil which contains healthy fatty acids that help in the growth of the hair. It also nourishes the hair follicles. Now, simply by using the castor oil, you can get good benefits in growing eyelashes and eyebrows, but if you want to intensify the good effects, you can always mix it with any of the healthy essential oils like lavender oil, rosemary oil, neem oil, tea tree oil, rosehip oil, grapeseed oil etc. The reason why I suggested adding essential oils is because of the presence of the antioxidants in them that helps in the maintenance and restoration of healthy eyelash and eyebrow growth. In addition, they also benefit and improve circulation in body. Take around 3-4 drops of castor oil and mix it with 1 drop of any essential oil of your choice. Now apply on your eyelashes carefully using a clean mascara wand or a Q-tip. As far as your eyebrows goes, apply the mixture using a cotton swab. Leave the solution overnight. Apply this remedy every night diligently and enjoy the benefits yourself. 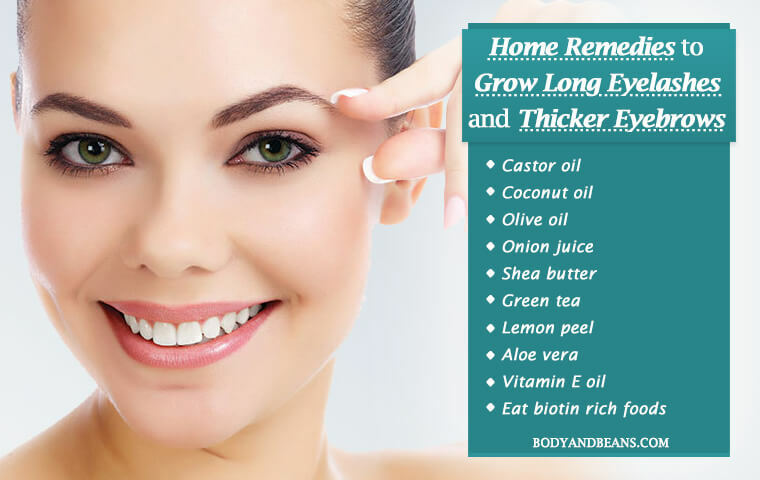 The coconut oil remedy is one of the best natural home remedies to grow long eyelashes and thicker eyebrows, as it is very beneficial for hair growth and several studies are a proof of it. In fact, there are several reasons behind its effectiveness. Firstly, coconut oil is a natural moisturizer and conditioner for your hair and helps in better blood circulation. Secondly, it is rich in fatty acids which work with the natural proteins your hair contains and prevent easy breakage of hair. Thirdly, the lauric acid which you found in coconut oil is a perfect antimicrobial agent so it helps preventing any kind of infection in the hair follicles. Lastly, the healthy nutrients like Vitamin E, iron and other proteins together aid in growing fuller eyebrows and in having thick and long eyelashes. Take a cotton swab, dip it in coconut oil and apply it evenly on your eyebrows. Then for the eyelashes also, you can use the cotton swab or can take the help of your fingertips. Do this every night before going to sleep and let it stay overnight. Wash your face in the morning using face wash. The next oil that I will suggest you to use to grow longer eyelashes is the olive oil. Since olive oil is rich in Vitamins A and E, that are instrumental in leading to proper hair growth, it works magically and helps you to grow long eyelashes. The nourishment of each hair strand is done by Vitamin E, whereas Vitamin A stimulates sebum production, which is our body’s natural oil which in turn, helps in growth of hair. Take some drops of olive oil in your finger tips and apply it on your eyebrows and eyelashes. Keep it overnight or for few hours before washing. Do it on a regular basis for maximum benefits. You can use a cotton swab even for applying the oil. You may not love the pungent smell of onions but if you are determined in having fast results as far as growing longer eyelashes and fuller eyebrows are concerned, then this onion juice remedy can be of great help. The reason why onion juice is so effective in growing hair is because it is rich in selenium, sulfur, minerals, Vitamin B, and Vitamin C, all of which contributes to the growth of your hair. And hence it’s so effective in growing long thick eyelashes and fuller eyebrows. However, sulfur is the most important component among them all because it stimulates the production of collagen tissues which is why it also strengthens your hair follicles. Onion juice is excellent for hair health as you already know but it is safer to avoid using it for your eyelashes because if by any chance it enters your eyes, it will cause a lot of irritation. But, if you want to still use it on your lash lines, then please do so with utmost care. Take an onion, chop it and put the pieces in a blender to get a proper smooth juice. Strain the juice and then apply on your eyebrows. Let it stay for an hour and then apply some diluted lemon juice on it with cotton swab to nullify the smell. Do the remedy every day to quickly grow thicker eyelashes. In Africa, organic shea butter is quite famous and people use it to improve the hair texture which it does, thanks to the presence of Vitamins A and E in it. Besides, that, shea butter nourishes your hair and improves the hair growth to a great extent, so you can always use it to grow your eyebrows and eyelash fast and naturally. You need to take some organic shea butter in between your fingertips. Then rub your fingers together to melt it. After that, apply it on your eyelashes and your eyebrows. Let it stay overnight, and wash your face in the morning. Do this on a regular basis to get maximum benefits. The health benefits of green tea is not unknown to us but do you know that it can also help you grow thicker eyebrows and longer eyelashes? Well, it is the presence of the several antioxidants in it that leads to hair growth and so you can definitely give it a try. Take around 1 tablespoon of green tea leaves and add it to a cup of hot water. Allow the leaves to soak in it for few minutes. Once the water gets cool, you can apply it to your eyebrows and lash line using a cotton bud or your fingers. Do this every night before going to sleep and keep it nightlong. The rest of it you may store in an air tight container and keep it in the refrigerator for further use. However, try to use it within 3-4 days. One of the other natural remedies to grow longer eyelashes and fuller eyebrows is by using the Vitamin E oil. This is because Vitamin E oil contains antioxidant properties that promote healthy growth of your hair. It also helps in proper blood circulation that further aids in the process of growing eyelashes. To get the maximum benefits in growing eyelashes, you need Vitamin E capsules. Prick the capsule and take out the oil within it. Apply it on your eyelashes and eyebrows using a cotton pad or with the help of your fingers. Keep it overnight or for at least 3-4 hours for fast results. Make sure you repeat the process every day. You already know the importance of olive oil and castor oil as far as hair benefits are concerned. In fact, I have already told you how you can have fuller eyebrows and long eyelashes using these two oils. But, if you want added benefits and faster results, then you can go for the lemon peel remedy where you will have to soak the peels in castor oil or olive oil. The reason why this remedy is worth mentioning is because you will be getting the hair benefits of castor oil or olive oil as well as will be able to enjoy the hair growth promoting properties of Vitamin A and C that are found in the lemon peels. In other words, you will get double hair benefits that will give you faster and most efficient results in very less time. Take a lemon and peel it off. Then cut the peel in small pieces and soak them into either castor oil or olive oil as per your choice for 2-3 days. Now, apply the oil on your eyebrows and eyelashes before going to bed every night and let it stay nightlong. Wash your face in the morning. You can take help of aloe vera to get fuller eyebrows and longer eyelashes. Aloe vera is very effective and promotes hair growth because of the presence of aloenin in it. It also rejuvenates hair and does not let it break easily. The best thing is aloe is non-sticky and gets absorbed really fast so you can apply it several times for the hair growth benefits. The aloe vera remedy is especially beneficial for people with excess sebum. It aids in getting rid of the excess oil and open up the follicular pores that in turn helps in the growth of hair in eyebrow and eyelashes. If used properly and regularly, it can actually give you permanent benefits. Extract the gel out of the aloe leaf and then take the gel and massage it on your eyebrows and also put some on your lash lines. Be careful so that the gel does not enter your eyes. It’s always better to use freshly extracted gel, but you can store the gel in the refrigerator to use it second time. Biotin, also known as Vitamin H, is very essential as far as hair growth is concerned and studies have shown its importance in this field. The deficiency of this Vitamin can actually lead to thinning of your hair and so to stop your hair from falling as well have longer eyelashes and fuller eyebrows, you must make biotin a part of your diet. Each biotin rich foods like eggs, avocadoes, peanuts, salmon etc. 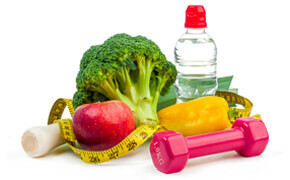 You can also go for daily congestion of biotin supplements to get the benefits. Well, petroleum jelly is not a natural remedy because it is after all a market product but considering the fact that it is one of the widely used products almost at every home, I thought of including it in my list of remedies today. Petroleum jelly is a great emollient which if applied on your lash line and your eyebrows daily can give you satisfactory results by making your lashes long and your eyebrows full. The process is simple. Take some petroleum jelly and apply it carefully on your lash line and your eyebrows using your fingers every night before going to sleep. Let it stay overnight and you wash it in the morning. However, if you have got too much of oily skin, prone to acnes, then it is better that you avoid this remedy as petroleum jelly itself contains a lot of oil in it which can add to your acne problem. All the natural home remedies to grow longer eyelashes and fuller eyebrows that we have discussed above are great and safe for your skin in general. Of course, there will be exceptions in some cases as the type of skin you got may not suit all of the above ingredients but that does not mean the significance of the ingredient is any less than the other ones as that same ingredient might work excellent for another individual. Since the eyebrows and the eye lash lines are quite sensitive areas of your face, you are advised to do bit of patch testing, wait for few hours in case there is any reaction before applying them directly on your face. This is for your own safety because I do not want you guys to harm your skin in any way. Moreover, more than the eyebrows, it is the eyelashes that concern me more because they are just too close to your eyes. There are many natural ingredients that are excellent and safe for your skin but if by mistake they enter your eyes, then that may give a burning sensation to your eyes and lead to irritations or infection. Hence, it is important to be super careful while dealing with the lash lines. Over to you: what do you do to get longer eyelashes and fuller eyebrows? Beauty definitely lies in the eye of the beholder but there are some basic criteria that make a person outwardly attractive. That definitely includes having thicker and longer eyelashes that make the eyes look pretty as well as having fuller eyebrows that kind of gives shape to not just your eyes but also to your entire face. You actually can understand the difference after you have done your eyebrows. It also gives a very neat and clean look to your face and make you look good pretty. Now, individuals mainly girls know the importance of these so having their eyebrows in shape and getting their eye makeup done becomes a part of their basic grooming. But, sadly, what most of you do is to use expensive cosmetic products from the market when there are natural ingredients which can actually help you get the desired eyelashes and fuller eyebrows that you want. Too much of application of lotions and creams is also not recommended as it clogs the follicles and stops the breathing process of the hair which, in turn, may prevent hair growth. Try to do some daily massaging as far as your eyebrows and eye lids are concerned. This is because it improves blood circulation and leads to better supply of nutrients for the hairs to grow. Combing is also a great option to do as it also helps in improving circulation and transportation of oxygen to the step, roots and bulb of hair by stimulating your blood capillaries. Drink enough water as it is not just good for your hair growth and texture but is needed for your overall wellbeing. Vitamins are great for your hair. Obviously the most important is biotin but the other Vitamins like Vitamin B and D are equally great. So, do include foods rich in them in your diet. The last thing that I want to tell you is that in case of eyebrows, I feel that threading is the best option to keep them in shape. But, please avoid over plucking as that may prevent hair growth. Also, I want you guys to avoid the option of waxing your eyebrows as much as possible. Ok, I think I have said enough and have given you enough tips on how to grow those desirable fuller eyebrows and thicker and longer eyelashes. Now, it is upon you to try these remedies to the best of your advantage. Do share me your feedbacks and suggestions in the comments section and let us know what you feel about the natural home remedies to have longer eyelashes and fuller eyebrows that I have just suggested. Have you tried any of these remedies? Did it work for you? What else do you think one should to grow longer eyelashes and thicker eyebrows? I am awaiting your feedback and comments. Until then, stay happy, look beautiful.